Dr. Choi values knowledge/skills and appreciates the harmonious relationship of art & science. In pursuit of excellence, Dr. Choi has completed additional two years of GPR residencies after graduating from the dental school where she served multiple leaderships. She continuously reads and studies with several renowned dental organizations such as Spear Education, The Dawson Academy, Invisalign, etc. To give back in a blessed heart, Dr. Choi follows annual dental mission trips to third world countries, and performs hundreds of surgical & non-surgical extractions. At Smile By Choice Dentistry, you will receive a spa like dentistry with aromatherapy & music of your choice. You can choose to get cleaning done under the dimmed light with our modern LED optic piezo scalers lighting each corner of your teeth! You will be amazed how soothing and gentle dentistry can be. Superior quality of materials are chosen as Dr. Choi truly cares about foundation. She is committed to providing a comprehensive treatment including cosmetic dentistry such as veneers, Invisalign, implants, botox for TMJ pain, and beautiful root canals. Full attention will be given for each individuals, as we promise one patient per appointed time. In our practice, you = friends & family. I'm guilty of not going to the dentist in four years. Over the years I have had discomfort for various reasons but never managed to make time to make an appointment. After reading all the online reviews for Dr. Choi I decided why not. I have never regretted my choice since. The staff is very nice they will call to remind you of your appointment. Overall excellent general dentist in Manhattan, Upper Westside. I have been a patient at this practice for a while now, way before Dr. Choi took over the practice. I can honestly say I’m very satisfied with the work she does. She’s very personal, she always remembers what’s going on in her patients’ lives. She recommended Invisalign for me, and she was a great help with that, along with all the regular cleanings and fillings she’s done for me. The clinic’s staff and Dr. Choi are very knowledgeable and friendly. They’re always on time and keep billing matters simple. When I had a toothache 2 years they were able to see me right away. I would recommend Dr. Choi and her staff at Smile by Choice to anyone. I can’t say enough good things about Smile by Choice. They do great work and are great people. This dentist office in the Upper West Side, Manhattan was right down the street from my office, and so I started going here about 3 months ago. I now work downtown Manhattan, but I still come here for the great dental service. I love going to my cleanings twice a year. I’ve never missed a dental appointment. Smile by Choice is very high quality dentistry in New York, NY. They have vaulted ceilings that let in natural light, the latest and greatest in technology, and an awesome staff that is very nice and easy to talk to. Going to the dentist can often seem like a chore, but this class makes it easy and even dare I say enjoyable. You’ll always feel like you got the best cleaning here, which is often not the case. And it’s never painful. Scraping tools can often be unpleasant, but they use an ultrasonic cleaning method that is very calming. They even give you a warm towel when you’re done with your cleaning, which seemed very first class to me! Unlike dental insurance, a direct dental plan with Dr. Choi and Doctors Network is a membership that gives you access to significant discounts on almost all of our services. Everyone can join for a low monthly fee of $49.99 and a one-time activation fee of the equal amount. The cost of membership is typically a fraction of most dental insurance premiums. Dr. Choi, our team, and the experts at Doctors Network share the common goal of making dental care simpler, more affordable, and more attainable for all of our patients. Please note that a direct dental plan is not insurance, and is not designed to replace your existing coverage. We offer this direct dental plan to help reduce your out-of-pocket expenses and therefore maintain your oral health. If you have questions about Doctors Network, or are ready to sign up, then contact Dr. Choi at Smile by Choice today, or call Doctors Network at 1-866-800-3168. Routine family dentistry is as essential to your smile as taking care of your teeth at home. For example, checkups and cleanings are necessary to evade oral health issues such as tooth cavities and gum disease. 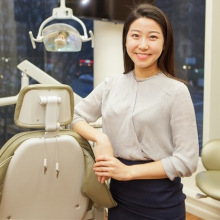 At our New York, NY dental office, Dr. Choi and our team offer a variety of general dentistry treatments to help you enjoy a lifetime of beautiful smiles. When it comes to your health, prevention is the best medicine. Therefore, the main focus of general dentistry is preventing issues from developing in the first place. Besides keeping your teeth clean with good hygiene, professional dental cleanings and check-ups help stop the accumulation of oral bacteria into plaque and tartar. Other procedures, such as tooth fillings, dental crowns, Invisalign® aligners, and more, can also help you manage existing issues before they grow worse. During your dental appointment, your dentist will carefully perform a comprehensive dental exam for signs of trouble. If any are present, then he or she will recommend an appropriate course of treatment to stop the problem from growing worse. However, caring for your smile will still rely on maintaining good hygiene and regular general visits to your dentist’s office. Make an Appointment with Your New York General Dentist Today! With a strong focus on prevention, preventative dentistry is essential to maintaining your good oral health. To schedule your next visit, call Dr. Choi's dental office in New York, NY today at (917) 412-2334.